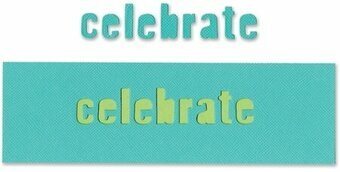 Movers and Shapers Magnetic Die - Celebrate. This Movers & Shapers window die showcases the style of Jen Long for Where Women Cook. The window die must be used in any one of the Movers & Shapers base dies or base trays, which are compatible with the BIGkick, Big Shot and Vagabond machines (with a pair of appropriately sized Cutting Pads). All items sold separately.